Lurline's Place: Happy Easter - Good Friday! Happy Easter everyone and to all you Believers, a blessed Good Friday! 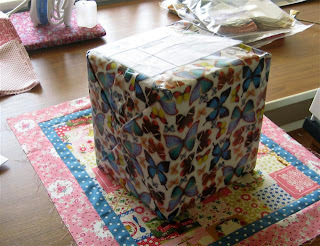 This is all very weird and exciting - this parcel arrived during the week and I thought 'oh, these are Narelle's Happy Houses for the Swap' - then I thought 'why would she wrap them like this - oh, just maybe she is my Easter Swap Partner' so I left the parcel until this morning to open! Yes, yes - thank you so much Narelle, and you already know how much I love your gift, thank you again! 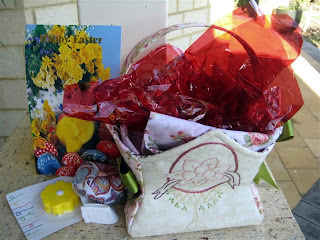 Pop over to see Narelle at Country Roses and take notice of her header - if you check past comments, you will see I have already told her I love this little basket and you will be able to have a really good look at it! Oh, beautiful fabric wrapped around Easter chocolates, I guess, a wrist pincushion and cute tape measure! This has given me a really bright start to Easter! 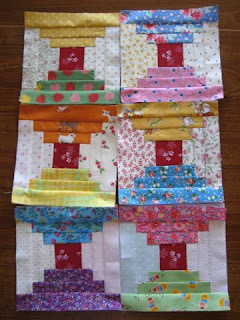 Yep, this is it - Dolly Quilt 2 - I'm happy with the 5" courthouse step blocks, foundation pieced, cute and easy - I will try to get another 6 done today! 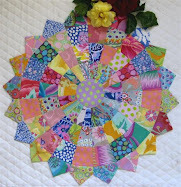 Dolly Quilt 1 is on the back burner - I will finish it as proposed - one day (lol)! I have had a magazine with the above in it for quite a few years now and think this quilt is just great, so I have been doubling and tripling as I cut each block, so there will be more about! Stay safe everyone and enjoy your Easter! PS - this should perhaps have been my priority in this Post - Australia has been so grateful for overseas help in our recent disasters, and I would like you to join me in thoughts and prayers for the victims and families who have been affected by the earthquake in L'Aquila, Italy. God bless! Lurline have a very nice Easter . Wow that is a big ciggie order I had to look twice at that one . Wow! What is with this ciggie comment? hmmm...? Happy Easter to you and yours. I hope you find lots of time to enjoy! So pleased it arrived safely. I was thrilled when you commented on the bag on my blog and couldn't wait for you to open it. What a lovely gift you got for your Easter swap!! That basket is gorgeous, I was admiring that on Narelle's header ;o). Happy Easter to you and what a lovely basket of goodies. Wow...lovely package......your courthouse steps is sooo springy...I'm planning a larger quilt using this pattern...Lots and lots of little one inch strips. Great gifts you received from Narelle. The basket is gorgeous. Happy Easter to you and your family Lurline. Happy and Blessed Easter to you too. Love your goodies and I love courthouse step quilt. Lucky you getting all that Easter goodness.. and I admire your patience I could not even wait to get home to open mine when I recieved it! The little blocks are cute as. Wonderful Spring package! Must comment on new courthouse step quilt too...that is just adorable!! Oh...then I just had to scroll down and see kitty.....my heart melted. What lovely work you do. 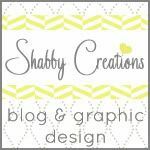 I am friend of Micki's and linked to your blog. Just love it and can't wait to see more of your work. The doll quilt is precious and that basket is so pretty.. I don't have a blog yet but I am thinking on it.